While the weather is becoming more like winter, our construction crews are still working away! You’re likely to see our crews working in the area of Gilkinson Street / South River Road. In areas that we are working, please be mindful and do not remove pylons, covers, or locate flags! These markings are important and also can present safety hazards if moved. It’s important that residents interested in Fibre to the Home sign up — we don’t want to miss your address. Signing up for Fibre will get your name and address on our list! Over the next week or so, our crews will be working on South River Road, First Line, Bridge Street, and surrounding areas. It’s important that residents interested in Fibre to the Home sign up as construction is in your area — we don’t want to miss your address. Signing up for Fibre will get your name and address on our list! Locates will be happening soon out South River Road, and you’re likely to see our crews working in the neighbourhoods of Bridge Street, Cutting Drive, Dickinson Court, Clarke Street, Halls Drive, and York Street. Did you know that we use directional boring (also called directional drilling) as the main method for burying our Fibre to the Home infrastructure? This machine is designed for minimal impact to surfaces, and is one of the key components to the construction process. First step, the drill creates an underground bore path. Second step, the drill literally pulls our conduit back through the underground path (our conduit is the hollow piping you see on those huge reels around town). Third step, our Fibre to the Home lines get blown through the conduit. As our main Fibre to the Home infrastructure is buried, we’re able to bury Fibre to each property that has signed up for service. Here is the video of our drop conduit machine in case you missed it from a previous post. Over the next week or so, our crews will be working in the neighbourhood of York Street East, Clarke Street, and Halls Drive. It’s important that residents interested in Fibre to the Home sign up as construction is in your area — we don’t want to miss any address, and signing up for Fibre will get your name and address on our list! Our crews are working in the neighbourhood of Finnie Lane, and shortly will be moving over to Cutting Drive, Dickinson Court, and York Street East, installing our facilities on Municipal property. As mentioned last week, we use the hydrovac method to vacuum dirt out of the area where we need to work, which helps to minimize surface digging and keep our construction as clean as possible. After preparing the ground, our horizontal directional drill installs our conduit underground on Municipal property, and then we place fibre into the conduit. After our fibre is in the conduit, we connect (splice) our mainline fibre. Finally, we’re able to bury fibre from the curb to the exterior of all residences that have signed up for service. This is why it’s crucial that if you want Fibre to the Home, you contact us to let us know, as we will need your permission to bring fibre from the curb to your home. Our crews are working in the neighbourhood of Spencer Drive, Healey, and McGowan Streets. So what are we doing when you see us working on and around the sidewalks in these areas? We are installing our facilities on Municipal property. We use the hydrovac method to vacuum dirt out of the area where we need to work, which helps to minimize surface digging and keep our construction as clean as possible. Our horizontal directional drill installs our conduit underground on Municipal property, and then we place fibre into the conduit. After our fibre is in the conduit, we connect (splice) our mainline fibre. After the work of laying our facilities on Municipal property is complete, we’re able to bury fibre from the curb to the exterior of all residences that have signed up for service. This is why it’s crucial that if you want Fibre to the Home, you contact us to let us know, as we will need your permission to bring fibre from the curb to your home. Installs in Elora are happening! Sign up today so that your name and address are on our list! Over the next week, you’re likely to see our crews as they continue work in the neighbourhood of Stafford Street and surrounding streets, laying Fibre conduit on municipal property. Installs are happening now in Elora, so just a friendly reminder that if you want Wightman Fibre to the Home service, you must sign up! We will not automatically bring Fibre to your location, so be sure your name and address are on our list! Visit us at 490 St. Andrew Street West (and yes, we are open late on Thursdays from 9AM-7PM!) Click here for a full list of our office hours. Part of the process of bringing Fibre directly to homes involves us installing a drop conduit (hollow piping) through which we’re able to bring Fibre directly to homes! As technology continues to evolve, new methods of burying conduit do, too! Check out this video of our contract crew installing a drop conduit on a property. Not only is it small (and therefore minimally invasive), this machine is operated with a remote control for greater maneuverability in small or congested job sites. The rubber tracks help to minimize any damage or disturbance to the ground, and the point where the conduit is buried appears virtually seamless. This drop conduit machine is able to bore under driveways and sidewalks, and can bury conduit at depths of 12 inches underground. We will only make arrangements to bring Fibre directly to your home if you sign up for Wightman Fibre to the Home. Visit us at 490 St. Andrew Street West in Fergus. Click here for a full list of our office hours. Why do I have to sign up for Wightman Fibre to the Home? We will not automatically bring Fibre to your location, so in order to make arrangements to have Fibre brought into your home, we need to know that you want the service. Even current Wightman customers must sign up to have Fibre brought to their home. What services can I get from Wightman? Mobility service to complete your quad-play bundle. CCTV IP cameras and Network Video Recording systems. What are the benefits of signing up for Wightman Fibre to the Home now? There are some great reasons to sign up for Fibre to the Home now. If you sign up now, your price will be locked in based on our current prices. That could mean signing up today, you would lock in to our 2018 rates. Signing up today also allows you to move your internet and/or phone service over to Wightman now, so you can start enjoying the Wightman experience. Also, installation is free while construction is in your area. How do I sign up for Fibre? What happens after I sign up for Fibre? After you sign up for Fibre, our previewer will make arrangements to come to your home and work with you to determine the best location to bring Wightman Fibre into your home. Once Fibre is brought down your street, we will call you to arrange an installation time that suits you. The flags and markings you may be seeing are called locates. 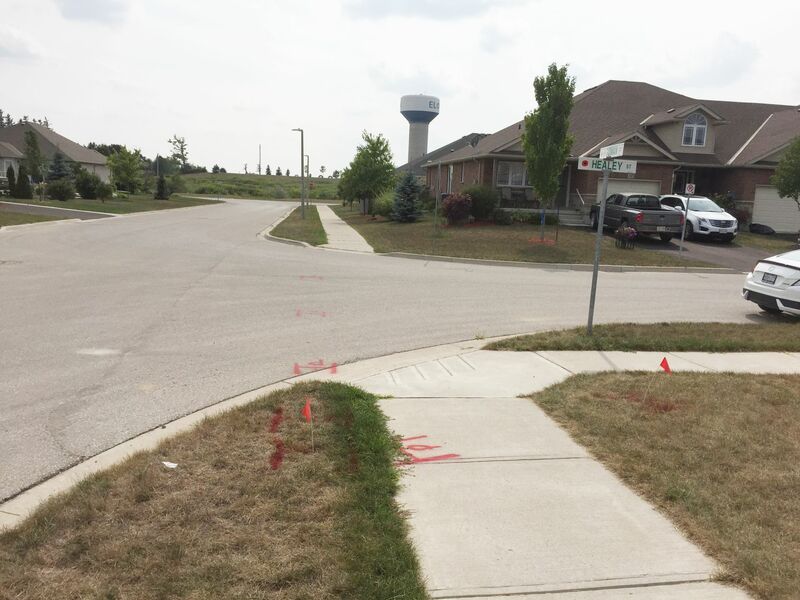 Locates are ground markings that identify where utility lines (such as gas, hydro, cable, water, etc) are located in the ground. These lines are identified using records or special locating equipment. While Dig Safe Month occurs annually in April, Safety is one of our values at Wightman, and locates are a very important part of our construction process. Understanding where utility lines and other services are located underground helps us to ensure the safety of our workers as well as the safety of the buried lines. Locates help us to determine where Wightman facilities will be buried on municipal property as well as under the ground to your home! As a reminder, please do not remove these flags while mowing your lawn or doing yard work. It's important that they remain in place! Construction is underway and Fibre to the Home installs are happening now in Elora. It’s important that if you want Wightman Fibre brought to your location that you sign up so we can ensure that your name is on our list. Visit us: 490 St. Andrew Street West, Fergus (and yes, we are open late Thursdays until 7PM!) Click here for a full list of our office hours. Over the next week or so our contract company, Avertex, will be starting work along Bridge Street and working down Stafford and Spencer. Locates have been called, and over the next week or so, you’ll see our contract company, Avertex, working along Stafford Street and the surrounding streets. They will be installing Wightman facilities on municipal property. Reminder that we will not automatically bring Fibre to your location. If you want Fibre to the Home or Business installed, you must sign up for service so that we have your name on our list. Call us 1-877-863-4273, email us ftthenquiry@wightman.ca, or visit us in Fergus at 490 St. Andrew Street West, and we’ll give you all the details you need! Our contract company, Avertex, continues their work off Wellington Road 7 and Bridge Street, installing Wightman facilities on municipal property. Over the next week, you’re likely to see locate flags popping up in the neighbourhood of Stafford Street, Spencer Drive, and surrounding streets as we moves into this area. 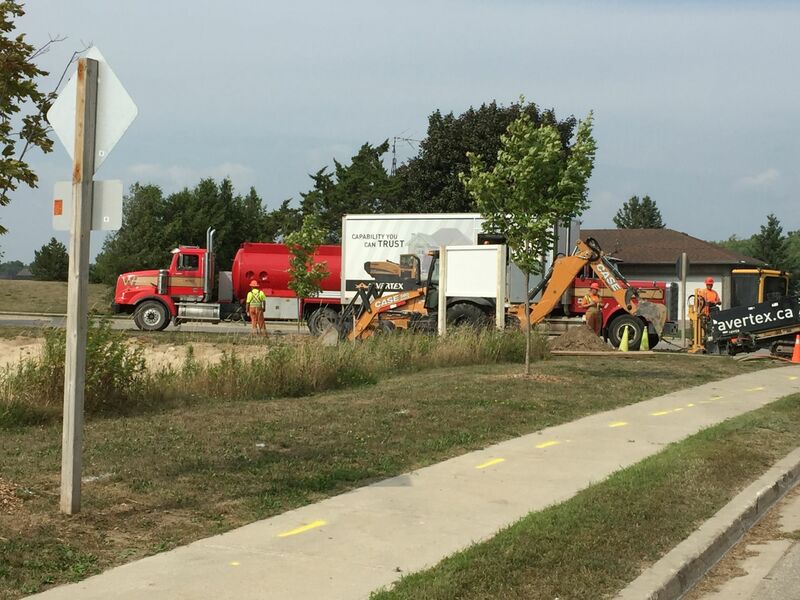 Our contract company, Avertex, is working along Wellington Road 7 between Speers Road and Hill Street, installing Wightman facilities on municipal property. This is a crucial step to our Fibre to the Home project. The large spools that you see in the area are spools of conduit for our Fibre. We will not automatically bring Fibre to your location: Homes and businesses that want Fibre installed need to sign up for services so that we don’t miss you when we go by. Our Fibre to the Home project involves us bringing a Fibre connection to each home and business that has signed up Fibre. To do this, first we must install and bury our fibre infrastructure in the street, we must prepare the building called our Point of Presence (POP) where we keep the technology that enables us to deliver Fibre to the Home services, and then from there we are able to bring Fibre throughout surrounding neighbourhoods. Pictured below is a behind-the-scenes glance at a piece of the technology that is housed in our Point Of Presence (POP) locations. Each of the yellow lines represent a unique connection. From our Point Of Presence, we’re able to bring Fibre to the Home connections directly to homes and businesses. Now is the time to sign up for Fibre. Our contract company, Avertex, is working in the area along Wellington Road 7 between McNab and Hill Street. Homes and businesses that want Fibre installed need to sign up for service so that we don’t miss you when we go by. You’re likely to see our crews placing our infrastructure (conduit for fibre) in the ground in the neighbourhoods of Water and York Streets over the next week or so. Our contract company Avertex is working to complete this mainline construction for our Fibre to the Home project! While we’re placing infrastructure in the ground is a great opportunity for you to sign up for Fibre to the Home. Homes and businesses who want Fibre installed at their location need to sign up, so that we can include you in our construction plans. This is also the time to take advantage of free installation while construction is in your area! We encourage you to stop by our Fergus office at 490 St. Andrew Street West, call 1-877-863-4273, or email ftthenquiry@wightman.ca and we will get you all the details you need to sign up. 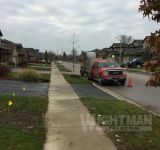 You can also visit wightman.ca/ftth for more information about Wightman Fibre to the Home. Our contract company, Avertex, continues work south of the River with several trucks in the area. Right now, while we’re in the middle of mainline construction of our Fibre to the Home project, is the ideal time to sign up for Wightman Fibre to the Home! Signing up now ensures that your home will be included in our plans! Even if you are a current Wightman customer, we will not automatically bring Fibre to your location. Homes and businesses who want Fibre must sign up so we don’t miss your location when construction is in your area. We encourage you to stop by our Fergus office at 490 St. Andrew Street West, call 1-877-863-4273, or email ftthenquiry@wightman.ca and we will get you all the details you need to sign up. You can also visit wightman.ca/fibre for more information about Wightman Fibre to the Home. Our work continues south of the River! You’ve likely noticed locate flags along McNab and the surrounding streets. Our contract company, Avertex, is working along McNab Street and several of their trucks are in the area. Now is the time to sign up for Wightman Fibre to the Home! Even if you are a current Wightman customer, we will not automatically bring Fibre to your location. Homes and businesses who want Fibre must sign up so we don’t miss your location when construction is in your area. 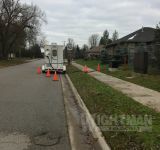 We are working South of the River, with our crews and contractors working and getting locates in the neighbourhood of McNab, Nichol, York, and surrounding streets. If you live in Elora and haven’t signed up for Wightman Fibre to the Home, now’s the time! We won’t automatically bring fibre into your building, so it’s important that homes and businesses who want Fibre service sign up so we don’t miss your location when construction is in your area. You can get more information about Wightman Fibre to the Home in Elora by visiting wightman.ca/fibre or calling 1-877-863-4273. You can also visit our Fergus office at 490 St. Andrew Street West to sign up, or email ftthenquiry@wightman.ca and we’ll send you the details you need to sign up. Even as we face more “wintery” conditions, you’ll see our crews working north of the River in Elora. We’re in the neighbourhood of Irvine Street along Stumpf Street and Marr Drive. If you see us out and about, be sure to give us a wave! 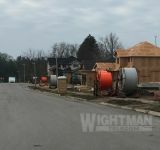 If you’re a resident of Elora but have not yet signed up for Wightman Fibre to the Home, we encourage you to give us a call at 1-877-863-4273, email us ftthenquiry@wightman.ca, or visit our Fibre to the Home sales office at 490 St. Andrew Street West in Fergus. Your home or business will not automatically be fibred – you need to sign up so we can ensure your property is on our list. Even as we head in to the winter months, we’re planning ahead for 2018, so make plans to visit us soon!